acrylic, ink and hand made paper on gessoed hardboard, 20" x 30" x 2"
The title for this painting, "Tango On", derives from the well known movie, "Scent of a Woman", a movie about blind, medically retired Army Ranger Lieutenant Colonel Frank Slade, played by Al Pacino. 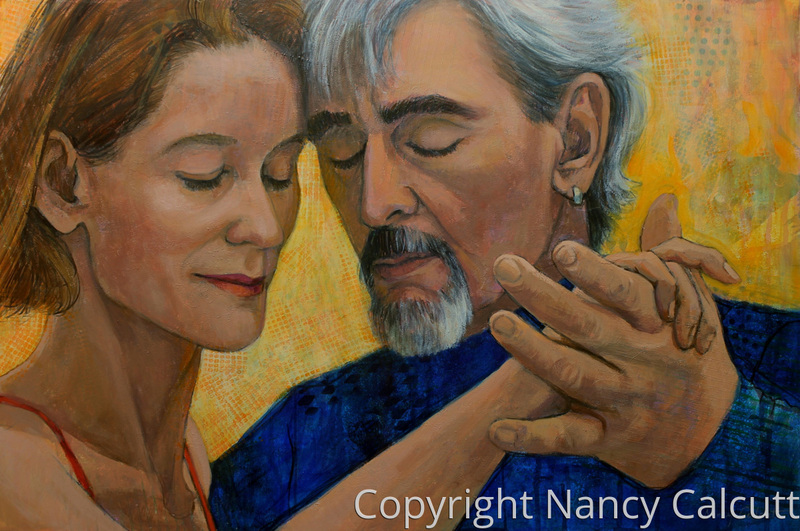 In the movie, Pacino's character dances a wonderful tango with a young woman who does not know the dance. He tells her that with tango, if you find yourself tangled up, then it is best not to worry and just tango on. I always try to remember that concept when I dance any type of dance!